Aberdeen is one of the society’s four Scottish branches, and serves both North-East and Northern Scotland. The role of the branch is to provide local representation for IS professionals, and help promote IS to the wider community. We achieve this through a varied annual events programme which include lectures, seminars and social events. In addition, the branch also acts a forum to enable networking between IS professionals. We also provide local support for the BCS’s nationally-managed competence and professional standards services. Watch a recording of our “A Manufacturing Revolution” talk by Peter Troxler on Wednesday, 21 November 2018. Visit our Videos page for a list of all of our recorded events. In 1976, Evening Express published an article about a visit to Aberdeen and talk from then BCS president Garry Fisher. 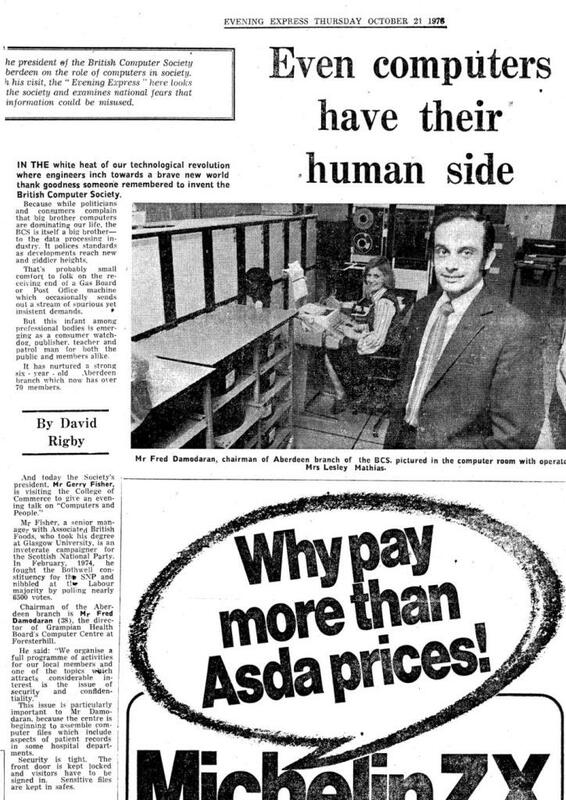 The BCS Aberdeen Branch had been going for 6 years and our then Branch Chair, Fred Damodaran, is pictured in the original article below. Our current Branch Secretary, Prof. Peter Gray, was one of the 6 Committee members back then.